Oshawa Generals team president and governor Rocco Tullio says the five-time Memorial Cup-winning club hasn't explored the possibility of changing its name now that General Motors plans to leave the city. The Generals are named after the automaking giant, with GM being their original sponsor when they joined the Ontario Hockey Association in 1937. After the announcement earlier this week that GM would be shuttering its plant and laying off its 2,500 workers by the end of 2019 there were calls on social media for the team to change its name. "We're steeped in history here. We've been around for over 80 years. We've had the likes of Bobby Orr," said Tullio. "...I understand it and trust me when it hits close to home like that, people are angry, right, and they want to lash out and I get it, but as an organization, we haven't even considered it at this point in time. " Tullio — whose hometown of Windsor, Ont., saw its GM trim and transmission plants close in 2008 and 2010, respectively — called Monday's news "disappointing" and said the team, along with the league, is looking into ways to reach out to those affected by the layoffs. "This isn't about hockey at this stage of the game, it's about supporting these families in our community," he said. 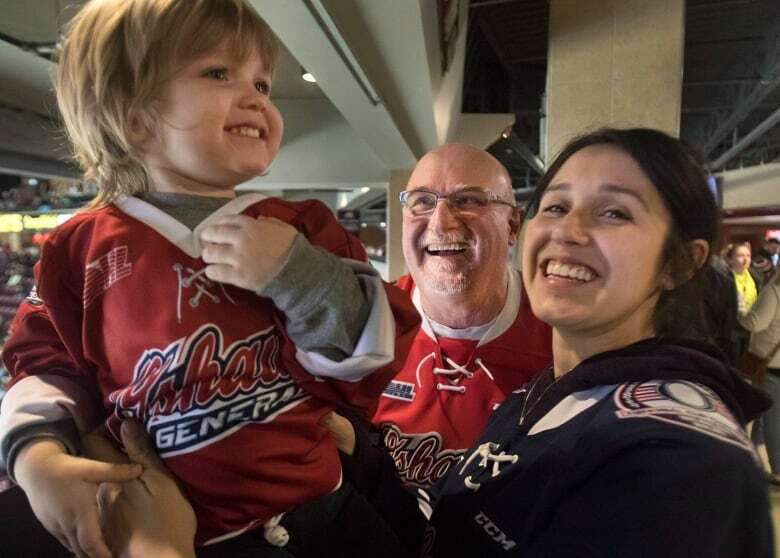 Jordan Sanders, 26, — who works on the GM plant's assembly line — was at Oshawa's first home game on Saturday since the news broke with three-week-old daughter, Peyton, two-year-old son, Cohen, and her father, Doug. Sanders, a single mother who has been on maternity leave since October and has worked at the factory for more than five years, supports the idea that if GM leaves the city the hockey team should change its name. "They don't treat any of the workers with any respect, because they just did this almost 10 years ago to the workers there and I wouldn't want to keep around a name like that in Oshawa," said Sanders, referencing the 2009 closure of GM's pickup truck plant. Sanders' father Doug, who spent 34 years at GM, helped her get the job at the company after previously working for feeder plants in the area. Doug Sanders, who was given a buyout and retired from that plant, was less certain about changing the team name. 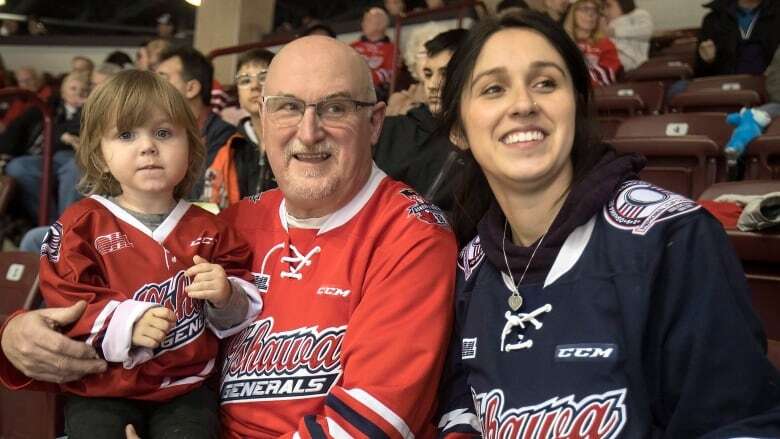 The former union representative and city councillor — whose son also works at Lear, a General Motors feeder plant in Whitby, Ont., and expects will lose his job — said he couldn't envision a team in Oshawa not called the Generals. He noted that the team was "built on the backs" of auto workers who donated money for the construction the Oshawa Civic Auditorium, which opened in 1964. Oshawa had no team between 1953 and 1962 after its former home, Hambly's Arena, burned down. Besides the crest on its jersey, the club has few remaining ties to GM in 2018. After the Generals left the Auditorium in 2006, the city opened a new downtown arena, called the General Motors Centre. But those naming rights expired in 2016 and Tullio said the team no longer has a direct affiliation with the American car giant. Season-ticket holder Ron Gallant, 67, who worked at GM for nearly 30 years and was also part of the truck plant closure in 2009, said it would be "strange" if the team changed its name, but understood why they might want to move on. "I mean, why should you be associated with something that has basically devastated the community?," he said. Andrew Landry, 39, — who came to the game with his flag-toting, seven-year-old son Callum — hopes the team could embrace a "change of focus" rather than a brand-new name, pointing to the city's Canadian Forces museum as potential inspiration. "We've got five Memorial Cups under the Generals banner name and I can't see that changing," he said. John Gray, a current city councillor and Oshawa's mayor between 2003 and 2010, said dropping the Generals would be a "knee-jerk reaction." "I think that's petty and vindictive — we are the Generals, whether (General Motors is) here or not," he said. John Snowden's links to GM span several generations. The 54-year-old worked in a number roles for the company, including in production and as an electrician, dating back to when he was a student in the 1980s. Both his brothers also had jobs with the automaker, as did his grandfather. The Oshawa native lamented the possible loss of the good-paying jobs in his community, but is holding out hope that GM's operations in the city can be saved and believes its hockey team should stay true to its past as well. "I think once a General always a General. I think we should keep it as the Generals. Keep back to our roots of where it used to be." "I don't like changing names, guess I'm a stickler for the old way of things."